Sometimes do you feel your heart skip at the thought of an issue….or do you just feel distraught when some thoughts cross your mind… I know that feeling too well. I remember about two years ago when I was dealing with some personal issues, I had so much anxiety that it started affecting my dream/sleep life. Oh how I hated those times, but thank God for today. I often say that in life my top three desires are to 1. to fulfil purpose, 2. have good health and 3. peace of mind. But more than often life throws us a curve ball which may affect our mood, thoughts, and even happiness, which is not God’s perfect plan. Jesus is the prince of peace(Isaiah 9:6) and above all he wants you to experience calmness and peace in all areas. Fear is also another subtle tool of the enemy, he wants you to live in fear so much that your fear holds you back from praying and even believing in the promises of God. It’s an expression of his deceptive nature, he wants to blind-side you on your position and privileges in christ. Remember my post on Deception . I feel that when we have fear or are emotionally unstable it breeds room for ill thoughts and is an expression of lack of trust in God. I’ve been afraid, I’ve been paranoid, and I’ve been very fearful of what tomorrow holds, but today I thank God for the understanding of his word. Peace is a birthright of a believer. Salvation comes with freedom, joy, deliverance, dominion and Peace. God is not a God of disorder but of peace (1 Corinthians 14:33). So how do we operate a life of peace? easy. Ask God to help you stop any habits that are ungodly and abide in him: Psalm 34:14 ‘Turn from evil and do good; seek peace and pursue it’ Also Psalms 119:165 “Great peace have they who love your law, and nothing can make them stumble”. 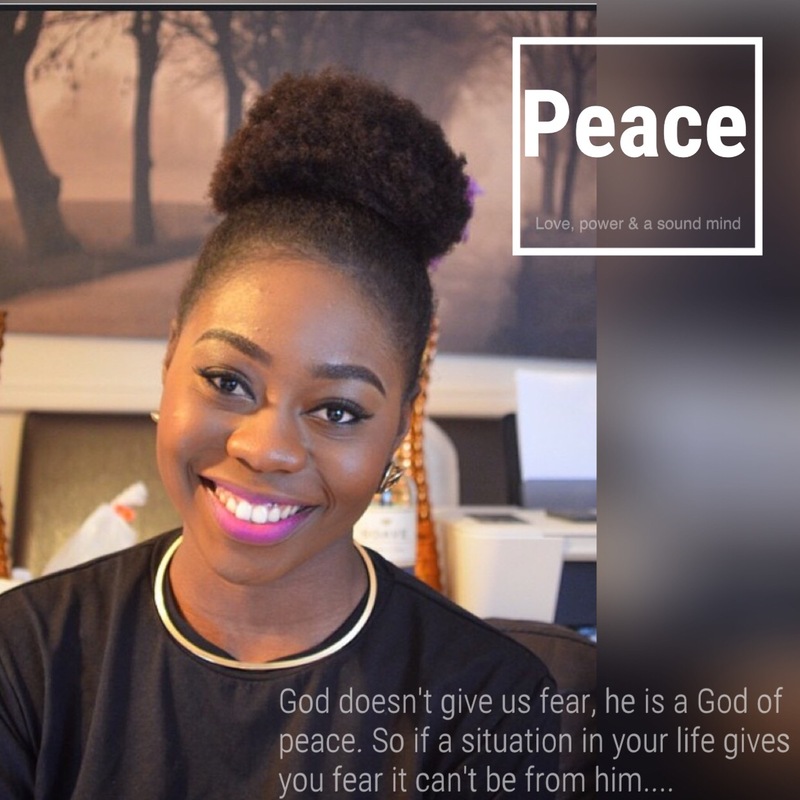 Know that God doesn’t give us fear, he is a God of peace. So if a situation in your life gives you fear it can’t be from him….I pray that every heart reading this post may be filled with the peace and joy of God that surpasses all human reasoning in Jesus name. Have a peace filled day, week, month, year and life ahead! Tosin dear,this post couldn’t have come at a better time,God is truly using you.Bless you!for the most part of yesterday I kept refreshing your blog after seeing on twitter that you had gotten the day off.and when I didn’t see a new post, I almost sent a mail but truth is my fears won’t even let me reach out.thank God for using you.God bless you again dear. I so much love your article,and it came at the right time because I have been unhappy for 2 days now,but am better today. 1) Is Worry the same as fear,or a result of it. 2) How do one fulfill purpose & even know your purpose 2 fulfill it. Worry is fear of uncertainty so I think it’s a preset of fear. It’s like anxiety. Hence msg bible says” do not worry about anything” also the post on purpose is coming up soon. But knowing purpose Comes from spending time With the one who gave you purpose (God). More fellowship means more revelation. And how to fulfil purpose is to walk in obedience and also being sensitive to the holyspirit . I would make a post on this topic as the spirit leads. Such a wonderful post. I’ve come to realize that the peace of God is a necessity. More of God’s wisdom and strength, my lady!